Hi, I'm Kathy your trainer. I know we're all busy, so I hope you'll take a few minutes to get to know me better. I'm 42 years old, I've been happily married for 15 years and have 3 great kids. I have lived in Texas all my life. I grew up in the country, but have lived in San Antonio for the last 18 years. I'm A.C.E certified and have been a trainer for over 9 years. I also have certificates in yoga, water aerobics, and senior fitness. I love to see my clients achieve their goals. I have worked with just about all different ages, sizes and fitness levels. My youngest client is 13 and the oldest is 78 years young. I also train triathelets and marathoners. click on the "Programs" button to the right. Living/dining rooms into my gym. "Tour My Gym" button to the right. I really like being able to train at home. I hope you feel like you know me alittle better now, but if you have any questions or would like further information, please feel free to e-mail me. Always check with your physician before beginning any exercise program. 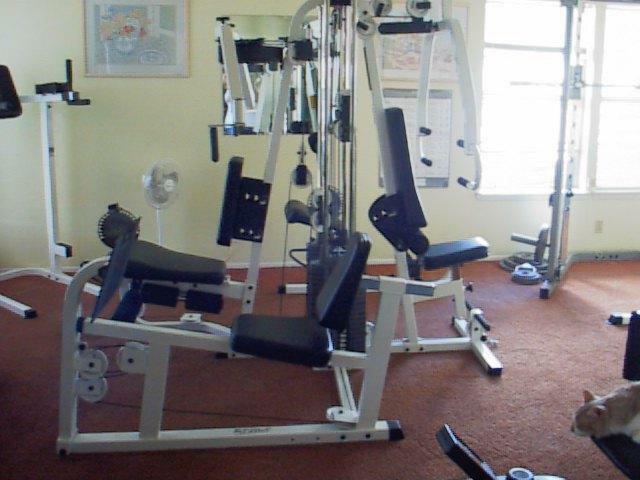 All photographs are the proptery of Kathy's Gym and are not to be reused or copied in any way without the expressed written consent of Kathy's Gym.